Now available from Guzzi Power: CNC Billet Exhaust Flanges. 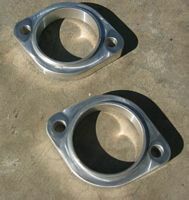 Replace those ugly, heavy steel exhaust flanges with these fine pieces cut in billet T-6061Aluminum. They're perfect for your next cafe racer project. These pieces fit all big twin Guzzis with exhaust studs- from 850T/3 850 Lemans to V11 Sport and EV1100. These do NOT fit loop frame Guzzis such as V700, Ambassador and Eldorado.